A sizable lineup of Continental washers generate up to 400 G-force spin speeds for customers at the Pearl Laundromat. 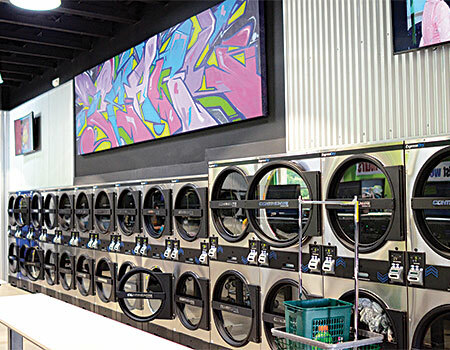 A wall of Continental ExpressDry® Dryers is highlighted by an original mural overhead. SAN DIEGO — As co-owners of seven car washes and two vended laundries in San Diego County, Calif., Mark Mariani and Teddy Torbati understand clean. They purchased their first car wash 13 years ago on Pearl Street in La Jolla, Calif. The “Pearl” stuck and has since been applied to all subsequent acquisitions and developments. Their most recent, Pearl Laundromat, sits alongside Pearl Car Wash on Home Avenue in San Diego. And that’s not just because people don’t wash cars when it’s raining but will do their laundry. Mariani discovered several benefits to running the two businesses, especially when they are located side by side. Laundry customers often head to the adjacent self-service car wash to clean vehicles after loading up their clothes in the washers, for example. Plus, there is significant labor and marketing crossover. While laundry attendants watch over both enterprises, patrons of the car wash receive incentives to visit the laundry. 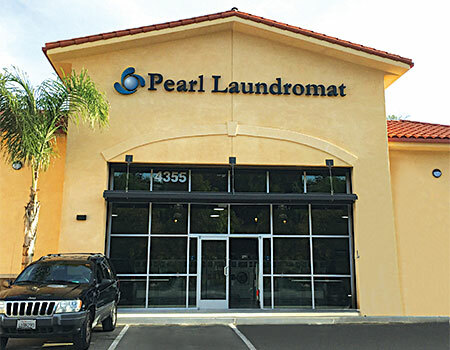 Pearl Laundromat, which the owners say turned a profit its first month, was born with help from Van Merrill, of Continental Laundry Development, in Santa Ana, Calif. In the end, Pearl Laundromat became the perfect partner of the car wash, which had been constructed seven years earlier. The 3,700-square-foot laundry is positioned in a dense area of rental housing less than 10 minutes from downtown San Diego. Mariani worked with the San Diego Cultural Arts Alliance to engage local youth in the graffiti-tagged neighborhood. The nonprofit strives to educate and inspire youth through the arts by redirecting acts of graffiti vandalism into something sustaining and beneficial to the community. Said to be the first laundry in the state to put in a lottery machine, Pearl Laundromat offers beverage, soap and snack machines, free Wi-Fi, flatscreen televisions, a Card Concepts Inc. (CCI) card system, and a mix of Continental Girbau ExpressWash® Washers, G-Flex Washers and ExpressDry® Dryers. Crafted for efficiency, Pearl Laundromat is lit during daylight hours by solatubes, which bring in natural light through the ceiling. During the evening, LEDs set the interior aglow. Pearl’s co-owners went with Continental laundry equipment for its water and energy savings, says Mariani. 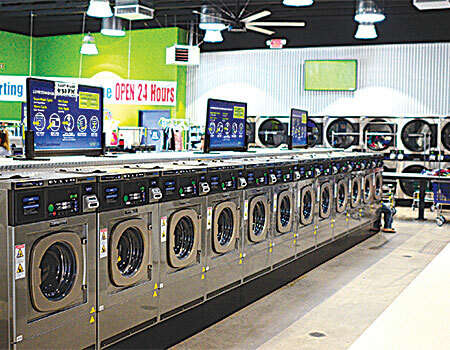 The card-operated store features a lineup of 24 20-pound-capacity ExpressWash freestanding washers; 19 40-pound and eight 70-pound G-Flex hard-mount washers; and 10 30-pound and 15 45-pound dual-pocket stack ExpressDry Dryers. Continental Girbau West handled the equipment installation. The washers, according to Merrill, deliver water-saving features and extract speeds from 200 to 387 g-force in a compact footprint. Facing the entrance in full view are the store’s most popular machines: the 70-pound washers. But a new 90-pound ExpressWash® Washer will soon debut, serving customers who clean comforters, blankets, sleeping bags and rugs, as well as family-sized loads of laundry. “We are anticipating that the 90 will be our busiest machine,” says Mariani. If it is, the mega-machine will ease the burden for the furiously busy 70s, plus bring extract speeds reaching 387 g-force for greater moisture removal, reduced dry times and less natural gas usage. Customers using the 90 will enjoy completing a mammoth load of laundry in less than 60 minutes, the co-owners say. By offering customers options, Mariani believes everyone wins. Customers appreciate the washers’ ProfitPlus Control for this reason. While the control offers standard cycles, it also allows customers to select an extra wash, extra rinse, extra spin or SuperWash. “We upsell the extras, with 50% of our customers selecting one,” says Mariani. Meanwhile, the CCI card system allows Mariani to quickly tweak equipment programs — vend prices, rinses, water temperatures/levels, extract speeds and rotation action — for additional energy or water savings. Mariani can accept credit cards, increase vend prices in penny increments, launch promotional campaigns, and track store operations, all remotely via the Internet. Intrigued by its potential, Mariani hopes to grow full-service fluff-and-fold from 15% to 30-40% of total store revenue. Soon, he’ll initiate an after-hours processing center and pickup and delivery services. Pleased with the car wash/laundry combo, Mariani maintains he’s always working to expand the Pearl brand — and the idea of “clean” — throughout San Diego.